Katherine Zook and her four children are facing their first Christmas without a loved one, and the future seems dim.But when a mysterious "Englisch" man begins to show up in the most unlikely of places, Katherine can t help but be suspicious . . . and a bit curious. WhenJoy Stolzfus s boyfriend tells her he wants to court other women, she s shocked.She pours her heart out in a letter, but it mistakenly reaches Noah Esh. The two begin writing letters back and forth, but a misunderstanding threatens to topple the relationship they re building. Anne Marie Smucker s life is pretty perfect. Until she discovers her widowed mother is getting married and they re all moving. On top of that, Anne Marie s relationship with her friend Nathaniel has changed, and she s more confused than ever about her feelings for him. Esther Glick bakes a Christmas pie for a fundraiser, and she soon finds herself sitting across from bachelor Ammon Schwartz. Esther receives many orders for pies, but when she breaks her wrist, she discovers what community and love are all about." 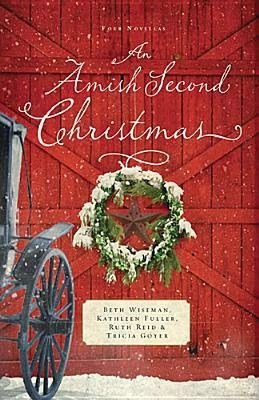 Ahh Christmas...and Amish fiction...and novellas... What better way is there to get yourself in the mood for the upcoming holidays? None that I can think of. With two of my favorite authors in this book, I couldn't say no to reading and reviewing it. I'm happy to report that I have zero regrets. What did surprise me was that my favorite story was by an author that I can't recall reading before. I'm not going to give it away because there's no fun in that. I want all of you to read it and let me know which was your favorite! Each author did a wonderful job in setting the scene, helping you get to know their characters and sharing tales that will stick in your mind as you prepare for your own Christmas.